Dmitriy and Jamie have graded to blue belt this week exceeding the expectations of John Sensei and Alan Sensei. The club have purchased some new equipment and the newer members are training with renewed vigour. Keep on training guys ..
A New Year begins with new goals and intentions for one and all. In December Dmitry and Jamie passed their Yon Kyu grading and now are accomplished Green belts. Congratulations to both of you! The club has had an influx of new members who are training hard and hopefully enjoying the skills we are teaching on the mats. 2007 was a good year with everyone progressing though their Jujitsu techniques and syllabus. John Plumbridge Sensei and Alan Murphy Sensei were involved in teaching at Mushin Seminars at Imber court and in Barry Sensei’s club in Colindale. Alan Murphy Sensei is arranging another Mushin Seminar hopefully for the first week in March ..watch this space for details. Alan Murphy Sensei has also volunteered to teach at a MAP (Martial arts planet) meet in June hopefully in the Reading area watch out for details when they are confirmed. We have also been asked to show our skills at an open air event in Imber court in July for charity. Again details will follow as the confirmed date is sent to me. John Plumbridge Sensei was awarded his Godan rank (5th Dan) in Jujitsu in appreciation of his dedication, commitment and knowledge of the martial arts. John has been studying martial arts for over 40 years and remains as enthusiastic now as when he first walked onto the tatami all those years ago. His infectious enthusiasm to both teach and attain “the perfect throw” coupled with his humble and quiete manner make him an ideal senior instructor for any club. Alan Murphy Sensei was awarded his Godan rank (5th Dan) in recognition of his continued training and instruction in the art of Jujitsu. Alans ethos has been and remains to study teach and develop a martial art that is street effective and enjoyable for all of our students. Jerry Spary Sensei tested and passed his Nidan rank (2nd Dan) displaying his continued improvement in technical ability, knowledge, understanding and proficiency at instruction in the Art of Jujitsu. 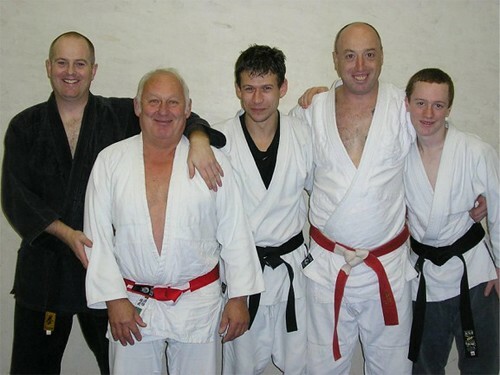 Jerry continues to enhance his skills through training at Staines club and other Jujitsu clubs in Surrey. Warren Townsend Sensei tested and passed his adult Shodan rank (1st Dan) displaying his skills and techniques learnt as a junior student in the Mushin system. Warren has continued to train and although still young has impressed the grading panel with his maturity and sensible approach to instruction as well as competency in execution of the techniques. These gradings are the result of many years of dedication, cuts, bruises, sweat, frustration, exploration but Mainly sheer enjoyment of our martial art Mushin Bushikan Jujitsu.Congratulations to all involved.